Rosemary showed her recently finished Dear Jane quilt at show and tell on Friday evening. Rosemary showed us 32 beautiful quilts that evening, and I really enjoyed seeing all of them. Welcome to Lolly's. This is my favorite shop in Shipshewana. 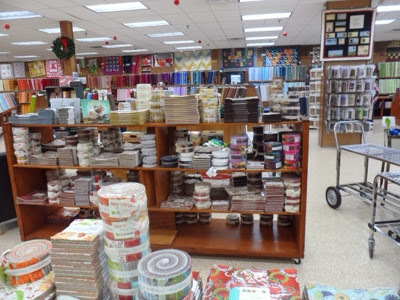 They have every type and color of fabric that you could ever imagine in this shop. Here is MayBritt shopping on her first trip to the US. Behind her is just part of the Kaffe Fassett and Philip Jacobs fabrics. This is a favorite of a lot of the girls at our retreat......the Civil War room. Here are some brights and over on the right are the Kaffe stripes. The Farmstead Inn is a comfortable place to stay, and it really feels like home here. Lots of us sit by the fire in the evenings to stitch, read or just visit. Every corner is beautifully decorated. I took this photo standing in the intersection in front of the Blue Gate one evening. Happy Thanksgiving to all of my readers who celebrate!! 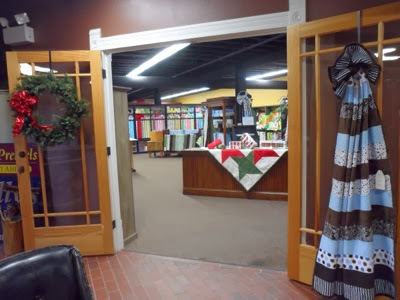 There is lots of fabric in Shipshewana besides other types of cute shops. 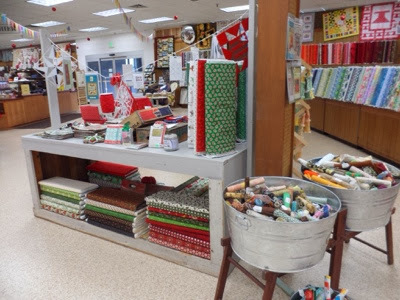 Since I am there for only a few days, I mostly visit the quilt shops. 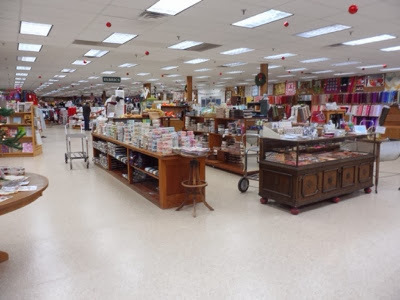 These photos are from Yoders Department Store. So many pre-cuts to choose from. There were so many jelly rolls and charm packs it was hard to choose. 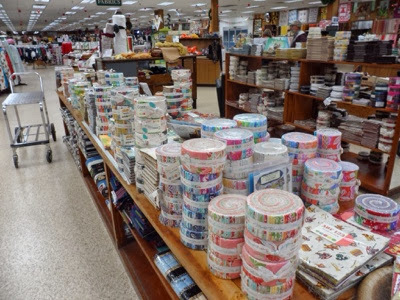 I could spend an entire week just roaming through this store. 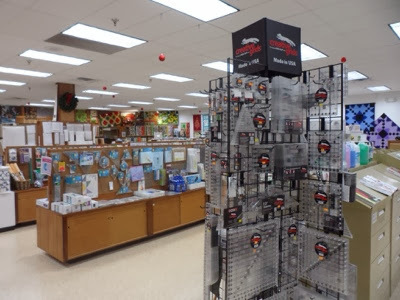 They have a great selection of Creative Grid rulers. This is a cute Christmas display with things hanging on a clothesline and two wash tubs full of fat quarters. 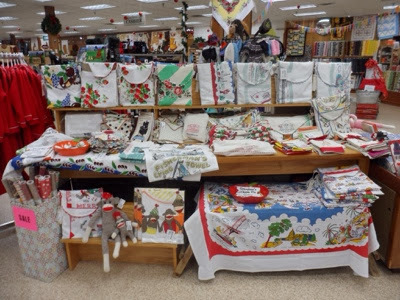 After looking at this photo of vintage looking table linens, I wish I would have bought one. 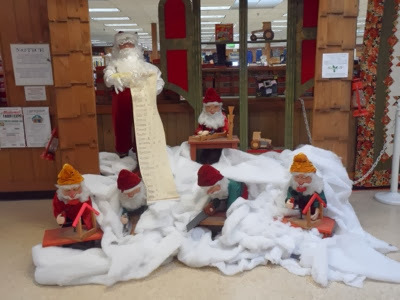 This cute Christmas display has lots of towels and aprons. We had a great time visiting with old friends and meeting new friends and enjoying the local foods and shops. I'll share more of the retreat with you over the next few days! I'm retreating with quilting friends from around the world this week in Shipshewana. The town is all decorated for Christmas. 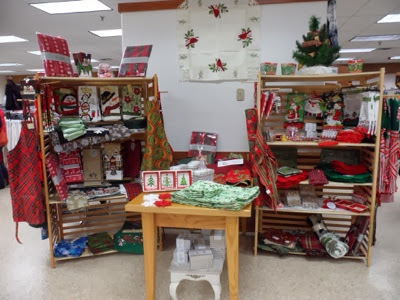 Here is a gorgeous Christmas quilt inside the Cuddle Corner in the Davis Mercantile building. Missing all of you that aren't able to be with us. We are talking, laughing, eating, shopping and occasionally we do a little sewing. 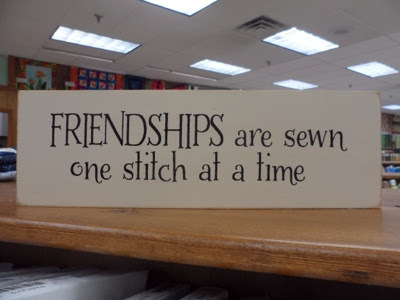 Hope you are finding some stitching time. Are you doing the 2013 Quiltville mystery? Are you planning to do the Bonnie Hunter Celtic Solstice mystery quilt for 2013? She has posted fabric requirements and paint chip colors on her blog here so that you can start collecting and planning. The mystery starts the Friday after Thanksgiving, and this year she is offering the quilt in two different sizes (111" X 111" and 75" X 75"). I know it's a busy time, but you can save the clues and work on your quilt through the winter months. Here are the fabrics I've collected so far. I've done some mystery quilts that just haven't worked out, but you can't go wrong with Bonnie's mysteries. I didn't know there was such a thing until two friends told me about it 3 years ago at the Dear Jane retreat, and I've done them all since then. Here is my Roll Roll Cotton Boll quilt. This was the 2010 Quiltville mystery. I just finished putting the borders on my 2011 mystery quilt, Orca Bay, and it's ready to go to the quilters. I am working on putting my Easy Street blocks together now (2012). I know a lot of people are hesitant to do any mystery quilt. My Easy Street pieces have been in a box since early last year, and even after all this time they still fit together just as if I'd pieced them last week. Bonnie's directions are always clear so there is no problem picking up where you left off. Let me know if you are planning to do the mystery and whether or not you are using Bonnie's colors or going in a different direction. 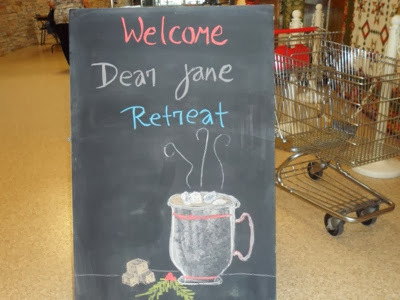 Speaking of the Dear Jane retreat, I'll be there in Shipshewana next week. I'm hoping to see/meet some of you there. I've been working more on my Road 66 hexagons from the book Primarily Quilts. Here are the last two that I've finished. I really enjoy the fussy cutting on these hexagons and will be kind of sorry when this quilt is put together. Here are a few of my earlier hexagons along with the outside border fabric. I probably have enough hexagons finished to do the entire quilt. I am still glue basting so that part of it goes quickly. These hexagons are 1 1/8". Oh Halloween night, we had a terrible storm blow through here. There was a lot of wind, hail and noise, but it wasn't until the next morning that we saw just how much damage we had. I think the largest limb that came down was 10 inches in diameter. We were lucky with this limb. I stash my unused flower pots here, and I think they saved that limb from taking out the hose that connects the heat pump with the house. The workers have most of the yard cleaned up now. The house wasn't damaged in any way, so we were lucky.